it occurred to me recently that I've been running this blog for more than two years now. I'm rather chuffed — I'm pretty sure that's longer than any of my diaries or journals have lasted, and certainly longer than any previous blogging efforts. In light of this surprising discovery, I wondered what I was posting about two years ago today, what fabulous bookcase I had recently stumbled across. 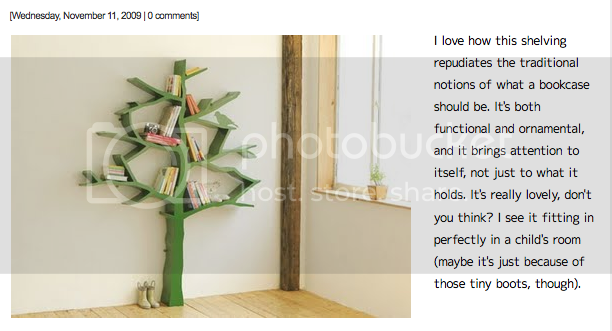 So here it is, the adorable bookcase that kicked off my fascination with all shelving tree-inspired. And two years later, it's still my favorite. I was remiss when I originally posted this, however, and failed to include the designer until the following week. He's Shawn Soh, and you can browse more of his work here.